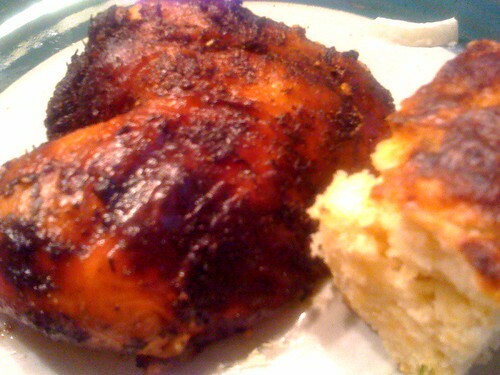 While my mom was visiting last month, N made jerked chicken. The three of us (plus dogs) sat out on the deck eating dinner and it was the very best chicken I have ever had. After Mom went back to the east coast, he made it again and I ate the leftovers for days without getting sick of it. Even after days upon days of leftovers I still wanted more! 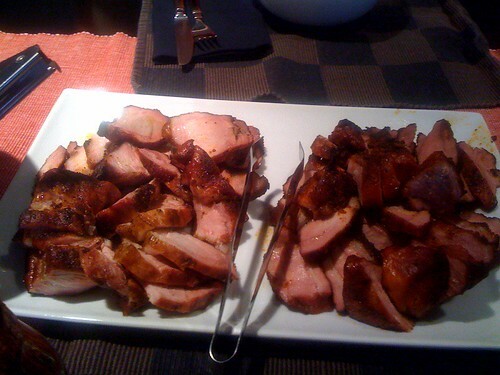 This is why we had jerk chicken on Saturday. My obsession. N cut the chicken into quarters and trimmed off as much fat as possible -- including under the skin. Between the chicken skin and meat he rubbed butter, garlic, sage, and rosemary. On the outside of the skin he used a small amount of butter (the leftovers from the under-skin application) and a lot of jerk seasoning and let it sit in the fridge for a couple of hours or so. 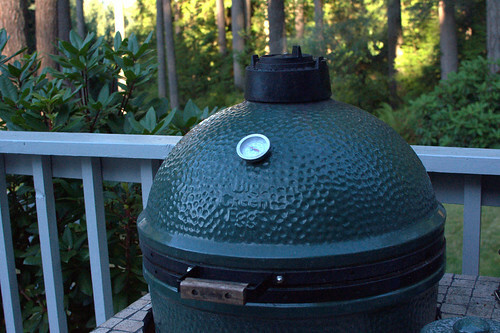 N set the Big Green Egg up for direct cook and filled it with charcoal. Once it came to 180°F, he put the chicken on, body cavity side down and slowly raised the temperature to 300°F. Because I wanted crispy, edible chicken skin (so bad for me but so tasty with jerk seasoning! ), once the chicken was almost finished cooking, he flipped it so the skin side was down and cooked it for a final 15 minutes to crisp the skin up. For the rest of the meal, it was so hot and I was too miserable to cook. I went the lazy route and just tossed together a quick salad of mixed greens, radicchio, cucumber, tomatoes, and raw onion (your favorite! ha ha). 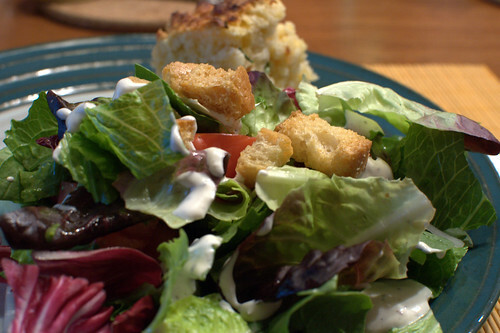 I also made Penzey's Creamy Peppercorn Dressing -- only with yogurt for a little extra tang. We really liked your cheddah-chive biscuits! I tried to resist but ended up having a second. They were so delicious! I'm sad you are all out of the accidentally-purchased buttermilk now. Mmm biscuits! 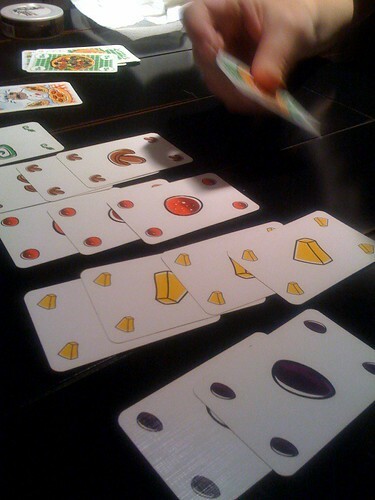 After dinner we eventually played a couple of games of Bohnanza, our default mindless game these days. I know I'm getting a little sick of it now (and it's my favorite game!) but it seemed like too much effort to play anything else when it was so warm. Maybe next time (as I keep saying). N found a game he thought would be good for us: Wool Rules! Maybe we should pencil in a trip to the game store next weekend. I asked G what he wanted to making - country ribs was his answer. I think we are stuck in a rut. Creativity set aside, I concentrated on paring down with just guca + salsa + chips, simple Cesar salad, and G's country ribs. Then G added [store bought] potato salad ...... and your stone fruits and berries cobblers, recipe from joyofbaking was so tasty! 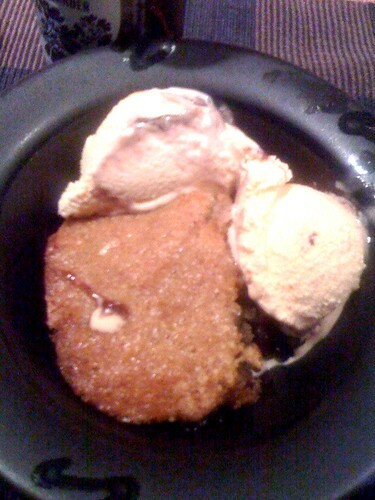 Paired with Black Raspberry Swirl ice cream from Vivians /Theno's, yum. I see the future, where I have cobbler for dinner. I was surprised when everyone agreed to play Mama Mia. I thought N doesn't particularly like this game? I think I've narrowed down to a short list of games - Modern Art, Ark, Wasabi, Acquire, and Frank's Zoo. Putting them on the $ queue.